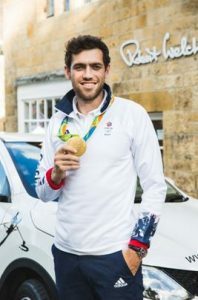 Stratford upon Avon Boat Club is delighted to announce that Olympic Gold Medallist Matt Gotrel as their guest of honour at this year’s Fun Regatta on Sunday 09 July. Now in its fifteenth year, the Fun Regatta attracts competitors from local companies, village and groups of friends. Around twenty six crews, with just three hours’ training compete in a number of ‘side by side’ races in the Club’s ‘learn-to-row’ boats, often in wacky fancy dress. Matt won gold in Rio in 2016 in the men’s eight. 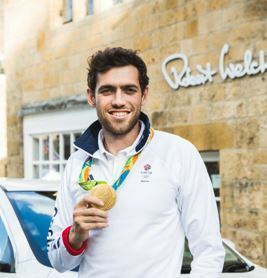 He had hoped to compete at the club’s Fun Regatta, with his sponsor Robert Welch Designs but has had to withdraw from rowing due to shoulder surgery. Robert Welch Designs, a local family-run company designing and manufacturing cutlery, kitchen knives and tableware from their base in Chipping Campden, are entering two crews this year. Matt will be at the Fun Regatta all day and will be presenting the winning crews with their medals. Racing starts at 10.00hrs, the victors will hopefully be crowned by 17.30hrs, other water traffic permitting. The Fun Regatta, originally called the ‘Pubs and Clubs’ Regatta, started on the Sunday following the main regatta. As the event grew in size, and popularity, it was moved to July as a standalone event. Entry requirements are simple: a crew of four people (with a basic swimming ability). Each team or ‘crew’ are given three one hour training sessions ahead of the race day with one the boat club’s volunteer coaches. On the day of the Fun Regatta, each crew are given a cox and compete in a minimum of three side-by-side races. The fastest crews qualify for the semi-finals and the finals. Fancy dress has become quite a major part of the day, with separate prizes for the best dressed and named crews. Over the years they have seen Ghostbusters, (complete with back-pack zappers), totally blue Smurfs, Abba, Wizard of Oz (Tinman, Scarecrow, Dorothy and Lion named Follow The Yellow Brick ‘Rowed’), Top Gun, pop group Kiss, several pirate crews including one which mounted a cannon on their boat which pumped out coloured smoke as they raced as well as Leprechauns, fairies and the like! Crews use stable ‘Learn to Row’ boats. These are also used all year round for those taking part in the Boat Club’s courses and help beginners gain confidence and skills as they take up and progress within the sport and, kindly, part funded by a grant from the Town Trust.